I dedicate these two pages to Cracotte, whose meeting gave me the idea of writing them. I recently met on the Web somebody who was looking for cuttings of the genuine Christmas cactus and I immediately decided to write these pages about this too little-known epiphytic cacti genus. S. X "Gold Charm"......................................S. X "White Christmas" ......................................S. X "Exotica"
WHAT IS CALLED CHRISTMAS CACTUS ? Christmas cacti designate the six botanical species of the genus Schlumbergera as well as the hundreds of hybrids which were produced from these plants. Their blooming period lasts, under our climates (Europe), from the beginning of September to February, period which widely includes the Christmas period. Thus, there is not one Christmas cactus but many Christmas cacti. The subject of this page is to talk about the botanical Christmas cacti, then to skim over the history of the many hybrids which have been created with them. Thus we have now hybrids which offer a fantastic and often little-known diversity. 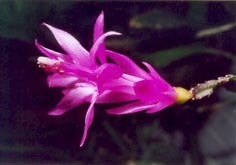 Schlumbergera (shortened as S. in this article) are epiphytic or saxicolous cacti native from the South-East of Brazil, near the towns of Vitoria, Rio de Janeiro and Sao Paulo, (red zone of picture A). 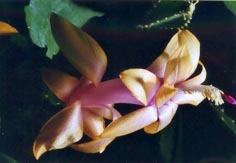 Thus, they are tropical plants which grow in the Southern Hemisphere. 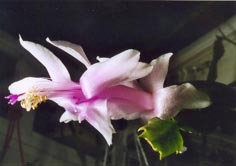 The name "Schlumbergera" was given by the botanist Charles Lemaire as a tribute to the French collector Frederic Schlumberger (middle of the 19th century). Among all the species of Schlumbergera, I will speak here only about the four species which were at the origin of the creation of a great number of hybrids. These four species are: Schlumbergera russelliana, Schlumbergera truncata, Sclumbergera orssichiana and Schlumbergera opuntioides. These four species have stem-segments with slightly different shapes. Blooming periods are also different. (I will indicate the flowering periods of these plants grown in the Northern Hemisphere and particularly in my collection). S. orssichiana has wide, large and sharply serrated stem-segments (picture B, number 2). It blooms at the end of August or in September. It was described around 1978. It is the last one to have been discovered. S. truncata has stem-segments of similar shape but a little bit smaller. It blooms in October and November. It was mentioned in 1819, not yet with its current name. Thus it is the first that was discovered. S. russelliana has rounded and nonangular stem-segments (picture B, number 1), smaller than the previous ones. It blooms from January to February. It was discovered in 1837. 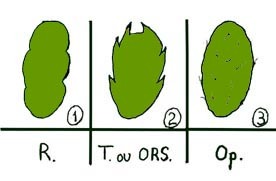 S. opuntioides has stem-segments looking like small Opuntia stems (picture B, number 3). It blooms in March or April. It was described in 1905. This long blooming staggering over approximately five months made it possible to obtain hybrids which, according to their pedigree, bloom from the beginning of September to February. Nearest relatives of S. orssichiana bloom first, followed by the near relatives of S. truncata, then by the near relatives of S. russelliana. VERY BROAD OUTLINE OF HYBRIDS HISTORY.